For an hour on Wednesday, the Glouster Public Library was turned into an owl education center. Like all branches of the Athens County Public Library, the Glouster library frequently has educational and fun programs for children. The owl program was presented by Joe Brehm, environmental education coordinator for Rural Action, and Leah Graham, an AmeriCorps volunteer working with the Sunday Creek Watershed Group, a division of Rural Action. During Wednesday’s program, they engaged their audience in games and hands-on lessons about the types of owls found in Southeast Ohio. Using a large chart, Brehm identified the owls that can be observed in the area. In order of the smallest to the largest, they are the saw-whet owl, eastern screech owl, barn owl, long-eared owl, barred owl, and great-horned owl. Brehm then played recordings of owl calls and sounds and gave the audience an opportunity to identify the type of owl. Owl legs and feet vary considerably between species, Brehm said, and with the help of the Ohio Department of Natural Resources he was able to demonstrate that in his lesson. The department loaned him a large case containing samples of avian feathers, wings, feet and talons. Holding one foot before passing it around to participants, Brehm gave a tracking tip. “If you ever see owl tracks, they are almost always like an X,” he said, passing the sample to Mallory Spencer, 11. “Oooh, it’s soft,” Mallory said. Brehm passed around the foot of a hawk to show the difference in tracks left by other species. The youngest in attendance was 4-year-old Olivia Koon. Her grandmother, Mary Duncan, said they learned of the presentation earlier in the day when they went to the library to sign Olivia up for a library card. Duncan said her granddaughter has a keen interest in birds and animals. “She doesn’t like animals — she loves them,” Duncan said. Graham told the children a Native American story about owls and explained how owls, which are nocturnal hunters, can see so well in the dark. She taught them several games, all based on knowledge of owl anatomy and how it helps them hunt. She also showed them how to make an owl call. As he ended his lessons, Brehm challenged the children to use what they had learned. Mallory said she’d wanted to attend the presentation because she’s had a special interest in owls for about a year. Tatum said she hoped the presentation will help her identify the type of owl that lives near her home. She said she can hear the owl’s call sometimes. 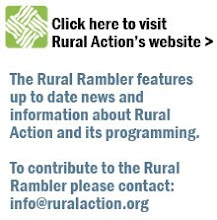 Brehm said Rural Action has a two-fold goal in making these kinds of presentations.